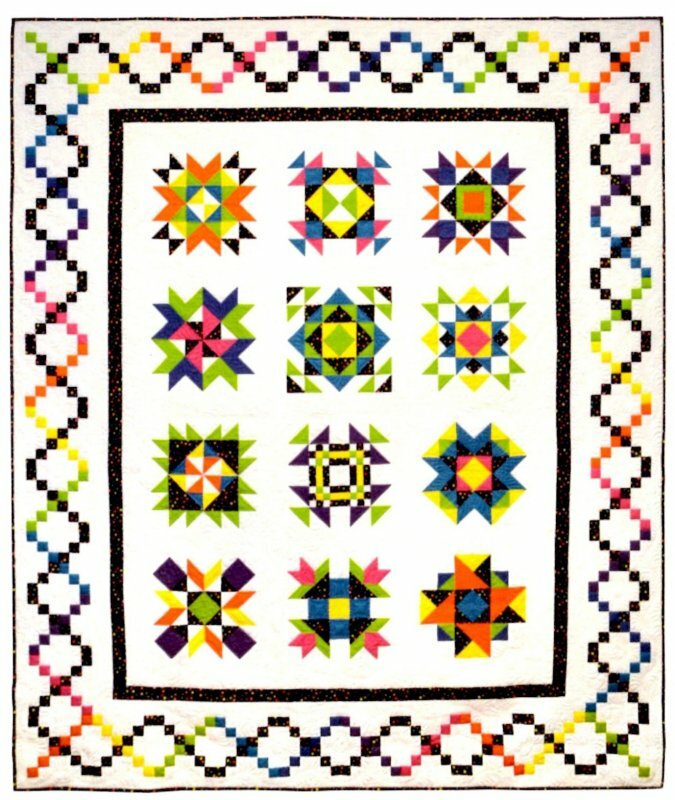 From Annie Unrein of "By Annie", this bright and happy new block of the month quilt features twelve 15" blocks made from batiks, white on white background and a cute multicolored dot on black print. This large quilt takes approximately 20 yards of fabric and finishes at 96" x 114" - easily large enough for a queen size bed and even some king-size beds (depending on how deep your mattress is). All pieces are easily rotary cut and traditionally pieced. No special templates or rulers are needed. 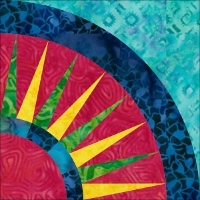 Annie's exceptional directions include cutting "charts" to help you make the most of each fabric in your kits. Sparkling Gems is great for beginners with lots of cutting/pressing/sewing tips. It's also challenging enough for experienced quilters (you might be surprised at the new techniques you learn)! Each block takes approximately two hours to complete, from starching/pressing your fabrics, cutting and squaring up the finished block. Sew much fun! Many of the blocks call for seams to be pressed open, and - although certainly not required - we recommend using Clover's "Press Perfect Iron Finger". It saves your fingers from getting burned by steam! As always, there is NO registration fee and shipping costs are included in your monthly kit charge. Choose from the 13-month or 6-month program below. Canadian friends, we've got 13-month and 6-month options (shipping included!) for you as well. Kits will ship on the 20th of the month, beginning February 2014. Join us on this sparkling journey!